Perfect your English and speak without an accent with this easy-to-use program developed by an acclaimed speech consultant and accent specialist. 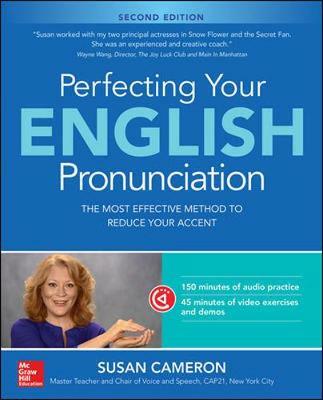 Unlike other methods that encourage you to mimic audio sounds, Perfecting Your English Pronunciation 2nd Edition focuses on the physical ability to speak English. The program takes care to note that many English sounds may be difficult to learn because they are produced farther forward in the mouth using tongue positions that may not be used in your native language. The DVD introduces you to mouth and jaw exercises to prepare you for speaking English, and then demonstrates mouth formations and tongue placement using nonnative speakers. The two audio CDs carefully go over the sounds of English, teaching you how to achieve those sounds. With this resource to guide you, you’ll soon be on your way to communicating in English with confidence.